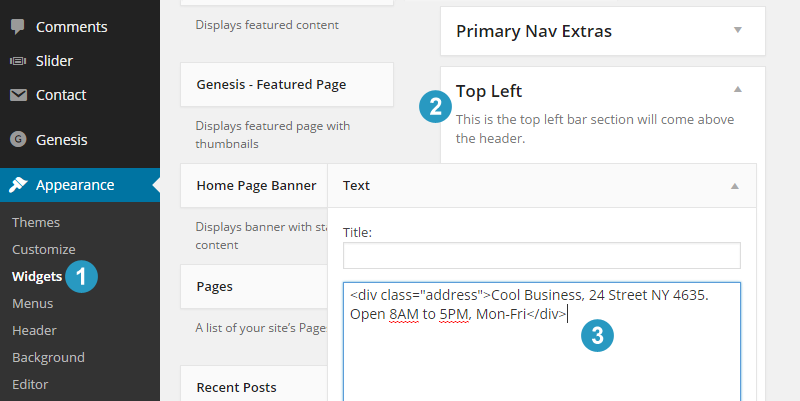 Flex theme header area has three main sections. First, the top left and the top right widget areas to show variety of content. Second, the image logo and the header right widget area. Third, the primary menu and the primary nav extras widget area. It is covered separately under “Configure Navigation Menus in Flex Theme“. 2. Add a text widget to the top left widget area. Recommended widget types for this widget area: a text widget or a custom menu widget. 3. To display address with the location icon, wrap text with address class (see screenshot for code implementation). Note: You can also display a custom menu in this widget area. Just add a custom menu widget to the top left widget area, select a menu and it should start displaying. If no menu option is seen in the drop down box, then go to Appearance > Menus and create a new menu. 2. Add text widget to the top right widget area. 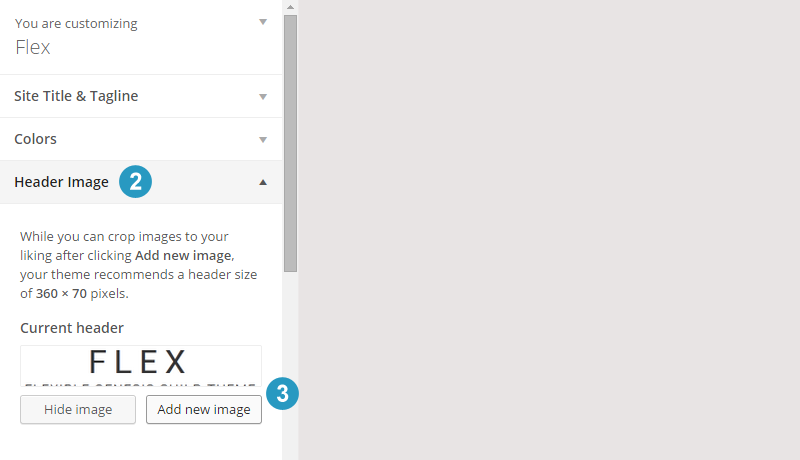 Recommended widget types for this widget area: an email subscribe box (via enews extended plugin), a search box (click to expand effect) and any text widget content like phone number. 3. To show phone icon next to the phone number, wrap the phone number with tel class. Note: The default logo image size is 360px (width), 70px (height). If you want to change the logo image size, then you need to make changes in the functions.php file and style.css file. This is out of scope of the default theme support and documentation. 3. Recommended widget types for this widget area: the search widget for showing big focused search box, a text widget to show some text, links or a small sized horizontal advertisement banner.